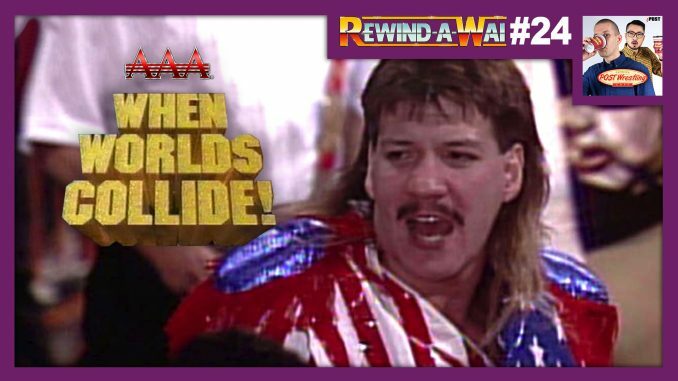 John Pollock and Wai Ting review the highly-regarded AAA & IWC When Worlds Collide pay-per-view when they partnered with WCW to present this event in November 1994. The legacy of this event includes a legendary Double Title vs. Double Mask match with El Hijo del Santo & Octagon taking on “Love Machine” Art Barr & Eddie Guerrero. Plus, a cage match between Perro Aguayo and Konnan, a 19-year old Rey Mysterio Jr., Madonna’s Boyfriend, the duo of Chris Cruise & Mike Tenay and more. We also welcome Lucha expert Rob Bihari (@RobViper) to discuss the legacy of this event, the state of AAA in 1994, the complicated history of Art Barr and what he was poised to do in the industry after this show, the major feuds heading into the show, how WCW promoted the card, the devaluation of the peso greatly hurting AAA & many more historical notes on the event and time frame. This edition of the Rewind-A-Wai is presented by Espresso Executive Producer, Robert Holzhammer. Watch the full show on YouTube here.